Thank you for your interest in Washington Extreme! 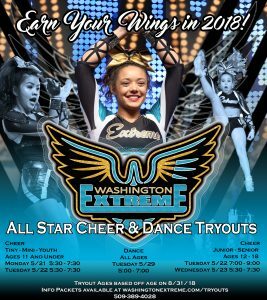 WE are looking forward to the best season of All Star to ever hit Spokane! Separately, Inland cheer Empire and Build It Athletix have been offering All Star cheer and dance for 6 and 9 years respectively, but this is our first season as a combined program. WE are thrilled you have chosen us as your cheer & dance “HOME” for the coming season.